The letter and FAQ below were emailed to CTU members on Monday, March 14. I write to you as we face a crisis in our schools as deep as any we have seen in a generation. 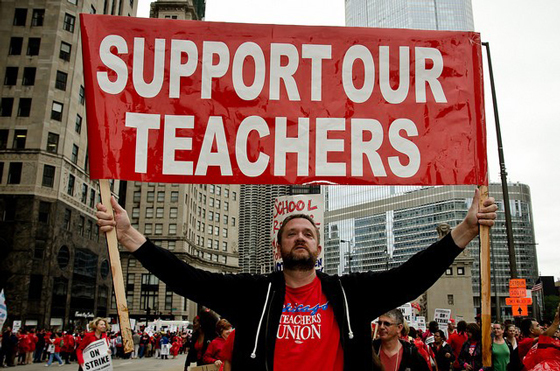 Please know that despite the uncertainty swirling around us, the Chicago Teachers Union will remain a steadfast and determined force in the fight for our contract, for our students and for well-funded public education. Now, as in the past, we see the powerful and wealthy undercut public education, neglect our pension fund, restrict bargaining rights and pass tax breaks for corporations and the rich. Still, they attempt to make us pay for the crisis they created. We are confident in our ability to stand up to them because we remain rooted in our schools and our communities, and we remain strong in our solidarity with one another. After threatening us for a month, Chicago Public Schools retracted its promise to cut our pay 7 percent on April 1—though the district is still announcing its plan to cut the pension pickup at the conclusion of fact finding in May. Obviously, we consider the Board of Ed’s retreat on this issue a victory for the CTU, but that win must be qualified by CPS’ plan to furlough employees for three days this year. The CTU, which had been seriously considering an unfair labor practice strike on April 1, is not prepared to stand down on that day—we do not trust the Board and we intend to organize a showdown on April 1 over the question of school funding and educational justice. Ultimately, our House of Delegates will decide this at its March 23 meeting. Below, you can read our answers to frequently asked questions about the proposal. The CTU is not the only force under attack by Mayor Rahm Emanuel, Gov. Bruce Rauner and the 1 percent they represent. For that reason, we will not be alone in taking action against them, as public service workers—from home health care nurses to university professors—have pledged to join our day of action. Private sector workers, such as McDonald’s employees fighting for a living wage, will also be acting in concert with our union. This is a broad-based, highly coordinated action that will raise the ante for our side just as Rahm, Rauner and CPS CEO Forrest Claypool have coordinated their attacks on us. April 1 will also highlight our proposals for winning school funding and funding for other important services. In addition to the vocal demands we have been making about toxic swaps and tax increment financing (TIF)—swap terminations cost the district $240 million this year alone, and the TIFs could put enough money into the schools to completely reverse this year’s cuts—we are also calling for a “fair tax,” which is an increase in the income tax for the rich in Illinois. This measure would put nearly $4‑6 billion into state coffers and provide a path to pass a fair school funding formula that would add hundreds of millions of dollars to CPS. Our calls for increased revenue for the district are now an issue on the national stage, and there is legislation pending in Springfield that would take TIF control out of the mayor’s hands and force the release of these funds to our schools. (1) Class-size and staff-to-student guarantees. Only guaranteed class size limits and caseloads for clinicians can provide the necessary support our children need in their classrooms and guard against devastating layoffs. (2) No cuts. We are not looking for a large raise, but educators cannot see our pay and benefits reduced while the wealthiest people and institutions in the state are let off the hook. (3) Close the loopholes in the promises CPS already made. Last month, the Board offered several promises that we find valuable. Included was a pledge of no economic layoffs; a promise to cap charter schools; a promise to improve REACH and make it less punitive; a moratorium on school closings; a promise to relieve counselors of case management duties; and improvements in areas of lesson planning, paperwork, testing and other aspects of our working conditions. These are all demands which we think are important. Unfortunately, some of the most valuable promises are unenforceable as written, or can be circumvented by state law. We call on the Board to close the loopholes and work with the CTU to change state law where necessary—for example, to abolish the Illinois State Charter School Commission, which voted two weeks ago to overrule three charter school closures mandated by CPS. So why won’t Emanuel or his handpicked school board give us a contract on these terms—especially when he is suffering many political setbacks and can ill afford a strike? Unfortunately for the mayor, after a career of attacking workers, he now finds himself being attacked by Rauner. The mayor needs Springfield to pass some kind of budget relief for CPS, but the governor appears determined to provoke an even larger fiscal crisis so that he can take control of CPS himself. The power of our collective action and resolve is undeniable. For example, our Elected Representative School Board bill, HB557, was passed overwhelmingly in the House on March 3 by a vote of 110 to 4. Additionally HB4579, which provides that a separate tax shall be levied by the Chicago Board of Education to guarantee contributions to the Chicago Teachers’ Pension Fund, passed by an impressive 98-14 vote. Now both bills head to the Senate where we will have to continue to push our legislators to abide by the will of the people. Despite our advances, the district continues its attack on our livelihood and we must continue to fight. Tomorrow, we have a number of leaders who need our collective strength at the polls, so please be sure to vote. Now is the time for us to fight for what we value. The CTU stands as a critical force in position to stop vicious attacks on public services and public education in this state. We are the most influential voice on public education, outpolling the mayor by a 3:1 margin on matters of education in Chicago. Our tasks may be daunting, but if we fight, we will inspire the public and become part of a larger movement that can win funding for our schools. Ultimately, that is our best hope for defending public education. What kind of action is this? This is a one-day job action to protest inaction on our contract, bad faith bargaining by Chicago Public Schools and the lack of funding for our schools. The date for an action like this must be officially set by the House of Delegates. A special House of Delegates meeting has been scheduled for March 23 so that delegates can consider setting the April 1 date as recommended by the Chicago Teachers Union’s leadership. With Rahm Emanuel and Forrest Claypool cutting our pay nearly 1.5 percent with three furlough days, still planning to cut our pay an additional 7 percent in a little more than a month, and pursuing school closures and additional budget cuts late into the school year, we must act to demonstrate our resolve. When we make a threat, and back it up, the powers that be take us seriously—and Rahm is already on the ropes. Now is the time to add Gov. Bruce Rauner and his millionaire patrons to our primary target list. Are we playing an April Fools’ prank on the mayor and the governor? No. They are playing with our communities by rewarding their wealthy pals with huge tax breaks, subsidies and bad bank deals. On the other hand, the CTU and our allies are dead serious. While the state budget impasse continues, the elderly, toddlers, university students, K-12 students, the disabled, orphans and the indigent are all facing a crisis of epic proportions. Poverty in Illinois is on the rise and racial disparities in income are growing to levels not seen in more than 50 years. The time to act is now. We intend to use our considerable collective power to draw attention on April 1 to a vision that supports the conditions the people in our state need and deserve. Emanuel and Claypool are incapable of getting the state legislature to fix the school funding formula, restore social services or keep our universities afloat. We, however, can. Our movement of educators, families, students, professors, train conductors, nursing home workers, social service providers and community organizations is growing. Just like a coalition came together to power the elected school board bill to an overwhelming victory in the Illinois House of Representatives, we can mobilize against the Rahm-Rauner attacks on our communities to pass a fair tax that will properly fund programs and institutions that are important to working families. Why a one-day job action? If we must strike to settle our labor contract, that strike will last as long as necessary to win a fair contract. But our April 1 job action is to send a message—to Claypool, Rahm and Rauner—that we are fed up with their bad faith policies that shortchange our students and educators. Is a one-day work action illegal? The mayor, the governor and their cronies will say it is. The mayor attempted, however, to declare our strike in 2012 illegal even though we played by his rules. With Rauner appointees now controlling the Illinois Educational Labor Relations Board, they will pull out every trick in the book to stop us. The only sure thing is that when we take our destiny into our own hands, we have more control over the outcome. They cannot replace 28,000 educators. When we are united and build strong alliances, there is little they can do to stop us. What are possible negative repercussions? We hope the district understands that instead of fighting us, they can work with us to restore tens of millions of dollars to our classrooms by going after the toxic swaps, demanding restoration of the tax increment financing (TIF) surplus and fighting for progressive taxation in Illinois. Will they seek to harm us? We do not know. But that would not be wise, given that this is a one-day work action. They may seek a court order to try to prevent or interfere with our job action. Depending on what action our House of Delegates approves, they might single out union leadership for retaliation. At the end of the day, if we make a compelling case to the public and are joined by tens of thousands of others in similar situations across the state, they will reconsider any punitive action. Be prepared, however, for lots of scary rhetoric from the mayor and Claypool. They will try to cajole, threaten and frighten us. Our resolve and clarity of purpose are the strongest antidotes we have to any fear-mongering. What happens to our insurance in a one-day job action? It should not impact our insurance. Even if our coverage was disrupted for a day, we have the ability to get COBRA, and payments are not due for two months. Just like in 2012, there should not be any problems with our health insurance coverage.